In a world where we’re constantly attached to our smartphones, tablets and laptops, it’s no surprise that our hands can often become a little overlooked. Dry skin, overgrown cuticles and flaking nails can be the result of too much abuse and not enough love when it comes to hand care. Although I love treating myself to a manicure and in-salon pamper once in a while, if I don’t look after my digits at home they soon look and feel neglected. With a few pieces of affordable equipment and an hour in front of the telly, you can easily give yourself a pampering experience that will have your hands looking tip top in no time. 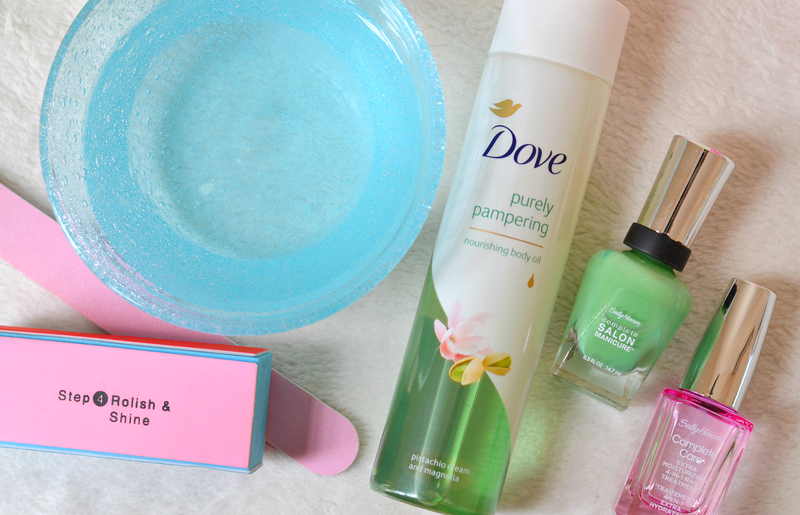 Using the key ingredient of Dove’s NEW Purely Pampering Nourishing Oil, here’s my step-by-step guide to a luxurious manicure that will leave your hands feeling pampered and loved. 1. Buff, file and shape your nails to the desired result using a four-sided file. Removing ridges, smoothing and shining the nail will help your overall look become more polished, as well as helping your nails to look much healthier in the long-term. In my opinion, shorter nails always look a little more elegant and show off polish to the max. 2. Fill a small basin or bowl with warm water (not too hot!) and add five drops of Dove’s Purely Pampering Nourishing Oil. Swirl the mixture a few times to distribute the oil and soak each hand for at least five minutes. The warm water will help to soften skin and enable you to push back cuticles later on, while the addition of the oil will help to nourish around the nail bed. 3. Once you’ve soaked your hands, dab a clean towel over the surface to remove any water or excess oil. Taking a cuticle stick, push back the cuticle area to reveal the full length of your nail and tidy up the edges; not only will this make your talons look neat and salon-worthy, but it aids growth and prevents flaking. 4. Add a drop of Dove’s Purely Pampering Nourishing Oil to each individual nail and massage it into the surface, paying special attention to the cuticle area which can often become dry and neglected. (This is often the focus of professional manicures and the key to a salon look!) Take your time to really work the oil into the nail bed for maximum benefit. 5. For an additional pampering step, why not take a few drops of the new Dove Pistachio & Magnolia Purely Pampering Nourishing Oil and massage into hands – the non-greasy formula and pistachio, sesame and sea buckthorn oils featured will help to hydrate and soften tired skin without leaving excess residue on the surface. 6. Use a cotton pad to wipe the surface of each individual nail to ensure it’s completely clean (leftover oil or water can prevent nail polish from sticking effectively.) Apply a strengthening base coat to the naked nail, ensuring your nail is protected from any potential staining while simultaneously adding in some much needed support. 7. Choose your colour (why not go for a summer appropriate pastel?) and apply first with a straight line of polish down the centre of the nail. Add two more ‘stripes’ to either side to ensure the nail is fully covered, making sure you don’t add any polish to the cuticle or skin – this can cause the colour to peel and flake after only a day or so. Apply a second thin coat, ensuring you don’t overload the nail or add too much – this will only lengthen dry time and can cause peeling if the result is too thick. 8. To finish the look, add a topcoat to protect your colour and nail. Pay special attention to the end of the nail, ‘sealing’ the top by running a thin amount of topcoat along the edge. Again, this will help to prevent peeling and flaking of the colour – especially if you’re typing frequently. Ta-da, you’re done! I hope you enjoy giving yourself a little pamper with my manicure tips. Are you a fan of at-home manicure sessions, or do you prefer to leave it to the experts? The ‘Purely Pampering’ Week is sponsored by Dove.